Now that April is here we are beyond excited to begin deliveries soon! First and foremost we want to THANK YOU for being a SPRINGing for Flowers subscription member! 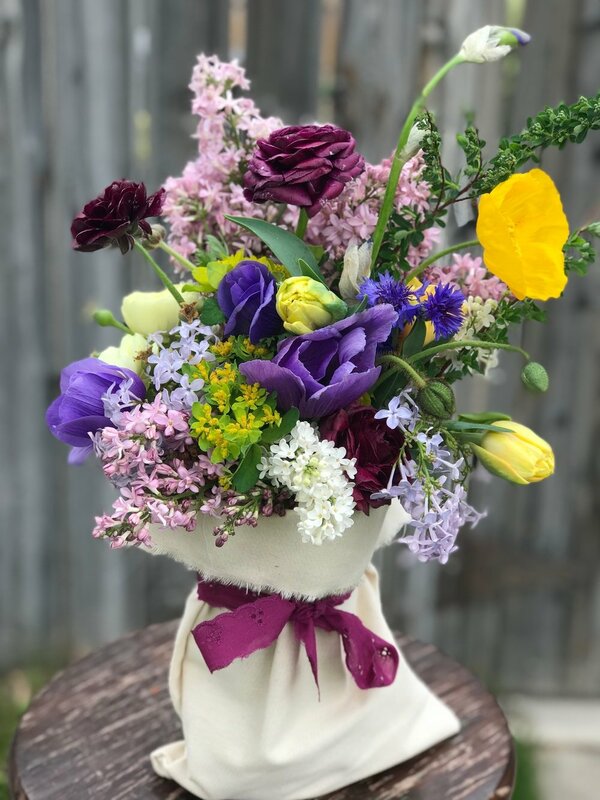 We love all of our amazing customers but our bouquet subscription members hold a very special place in our hearts: especially our spring members. You are family! You invest with us and are patient all winter long, we appreciate that more than you can know! Your support allows us to invest in the necessary seeds, amendments, supplies and tubers to launch our season. With the new property, we think it’s going to be a good one! 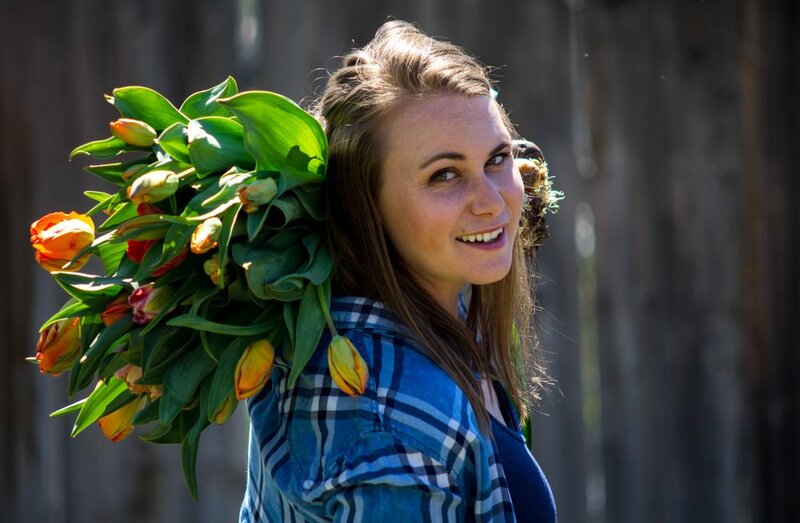 We are also excited that you, our amazing member, get the first of our blooms for the 2019 season! This year we have had quite the winter around here, huh? Since we field grow our flowers, it did have an impact: we are facing a delayed season. I know, boo! The good news is, things are finally peeking from the earth and we have nestled well over 1,000 ranunculus in the ground and hundreds of sweet peas! Despite the chaotic weather and hungry bunnies: they are happy and thriving. It is always our goal to launch our deliveries in early April, this year it looks like it will be late-late April before the flowers kick it in to gear. Don’t worry! We will keep you updated and give you a heads up when the first delivery is to commence! With that said, deliveries will finish up in the month of June. The good news is your subscription will end with some early summer flowers. If you have any dates that may conflict with receiving a delivery, please do not hesitate to reach out. We are more than happy to accommodate. Reno/Carson City deliveries will be on Tuesdays. Gardnerville/Minden/Genoa deliveries will be on Thursdays. The 8 delivery schedule will be weekly. The 4 delivery schedule will be every other week. What we got growing for you! We have all kind of delicious flowers nestled in the ground. Here at Sierra Flower Farm we aim to grow the unusual varieties that are not typically seen of the classic flowers we all know and love! Here are some photos of the flowers that were featured in our SPRINGing for Flowers Bouquet Subscription last year. Eeek, just looking at them is making me drool in anticipation! An array of daffodils that you won’t find just anywhere! We’re talking some fancy daffs that are oh-so-fluffy and have a smell of clean soap. Ruffles, trumpets: trumpets with ruffles! Small daffodils that look like swirls of sherbet. They will fill your house with a delectable fragrance and warm your heart. Tulips in a vase are less of a flower and are more like performers! Twisting and moving as if starring in their own ballet production. You won’t see single easter-type tulips here! We love the doubles, that could easily be mistaken for peonies! The parrots that look like a Van Gogh painting come to life! Just to name a few! These guys have been keeping us busy (or should I say Peter Rabbit!). The ranunculus are tucked under row tunnels and are looking the happiest of the bunch in the new garden! We cannot wait to share they fluffy goodness with their light scent, think rose scent but toned down! Right behind the ranunculus are the anemones. The two together always create a swoon-worthy combination! We should be expecting these lovelies to debut in May! And of course, one of our absolute favorites: sweet peas! We have two full rows dedicated to just these beauties! Despite temperature fluctuations, snacking bunnies and insane winds, with our pampering, they are getting ready for take off! Come mid to late May, we should have walls of sweet peas! The above show stoppers are not enough! Like any star, they need some supporting actors! Larkspur the color of a moody sky, bachelor buttons the color of midnight, bronze calendula and yummy stock just to name a few! They are all growing to be nestled into your bouquets! I am looking forward to handing you blooms soon!